Flashback to last year’s awards. The Commissioning Specialists Association 2016 awards is fast approaching, and we are looking forward to announcing the winners at the Gala Awards Ceremony on 17 June at the Copthorne Effingham Park Hotel. The awards are an excellent and enjoyable forum in which to celebrate the hard work of our members and to showcase the business and professional excellence right across our industry. We have had over 30 finalists across the seven categories. I am particularly excited by the support in the categories for investment in training and student of the year, as training and career development is one of the CSA’s prime objectives. By training and supporting our current new starters and assistants we are working towards bridging the significant engineering and technology skills gap in the UK. We are very proud to witness first hand the progression of field engineers from first entry level through to commissioning managers and beyond. As an association we are very lucky to have had and to continue to have such loyal supporters and such great individuals who helped to make our first gala awards night last year so special. There is always one individual who has made a significant and consistent contribution to the commissioning arena and our association throughout their career, and they are awarded with another of my favourite categories — the lifetime contribution award, which enables us to all celebrate their special achievement. The inaugural awards last year proved to be an excellent and enjoyable forum in which to celebrate business and professional excellence right across our industry, and what a great way to help celebrate our 25th anniversary year and ‘25 years of making buildings work’. The winners of the various categories demonstrated innovation and achievement in innovation. I am really pleased with the extremely positive feedback and overall reaction to the 2015 Awards which has been incredible. To indicate the standards that can be expected this year, here is a summary of last year’s awards. Winner of the category for project of the year was Crosscount for its work at The Quadrant in Milton Keynes. 2015 engineer of the year — Tom Bradbury. Crosscount was appointed for all MEP commissioning services for the new regional headquarters building for Network Rail. It is naturally ventilated and has passive design features. BAM Construction appointed Crosscount during the pre-construction phase, and the early appointment enabled commissionability and feasibility studies to be undertaken at the correct stage of the project. The overall success of this development was helped by seasonal commissioning and post-occupancy fine-tuning. Ashford Environmental Services was named commissioning provider of the year. The company provides a full commissioning service from design audit, through construction, inspection, supervision and commissioning management, to pre-commission cleaning, pre-commissioning, pre-test and balancing checks, commissioning and performance testing. A major client has engaged Ashford on some very challenging projects over the past 10 years. Ashford’s staff resource enabled the programme to be met when the commissioning period was compressed. 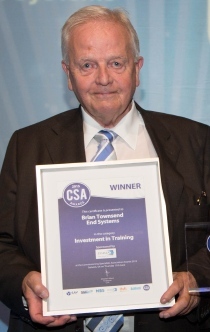 The award for investment in training went to Brian Townsend, managing director of End Systems. Six members of the staff of End Systems nominated him for this award. Winner of the category for innovation in commissioning was the Belimo Energy Valve — a characterised 2-way control valve with adjustable flow rate and sensor-operated flow control. It can monitor power and energy. The Energy Valve is described as revolutionising the regulation of flow rate and hydraulic balancing. A single valve measures, controls, balances and shuts off flow, and shows where energy is being consumed. Hydraulic balancing takes one person less than a minute per line. A web-based interface enables energy readings to be recorded. 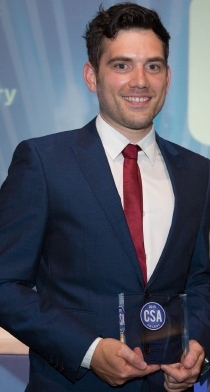 Student of the year was Robert Cleworth of End Systems as the individual who best demonstrated the achievements gained through the successful participation in the CSA training programme and/or other building-services educational programmes. Robert had completed all three distance learning courses, passing each with merit. 75% on course A, 79% on course B and 79% on course C.
Engineer of the year was Tom Bradbury of Airtech Premier. He was described by his employer as having a natural engineer’s brain who can instantly spot how systems are designed to work, identify any issues with the installation and commission a system to ensure it meets its design criteria. Commitment to training — Brian Townsend. On a recent prestigious project, faulty DPCVs were encountered, and there were issues with the PICVs. Tom Bradbury helped to identify the problems, reported them at commissioning meetings, arranged for the manufacturer to attend site, carried out tests and helped to develop a series of actions and recommendations to correct the problems. He is a great believer in working to save the environment and has enjoyed various retro-commissioning works to help reduce energy costs. And the final award last year for lifetime contribution went to Nick Ward of Prime Environmental Services, for which I read the citation. ‘Nick Ward has been involved within our industry for a very long time! ‘He started in the late sixties and early seventies as a draughtsman for Haydn Young with big old drawing boards and carbon sheets. He then moved onto balancing works at the Barbican in London, before working with Andrew Reid and Partners, JPS, then at GSK in Harlow, followed by Commtech and now as a founder of his own business. ‘Personally I have known this man since around 2003 when I worked with him at a retail mall in Canary Wharf. He had a great rapport with the clients and was always willing to teach and share his vast knowledge. ‘As I got more involved with the CSA, I spent more time with him, and you could see his passion for our industry, especially with getting people registered and involved with the CSA. You know he is always there for a bit of advice or just a friendly chat! This year’s CSA awards will be announced at a gala dinner on 17 July and will be reported in next month’s issue of Modern Building Services.